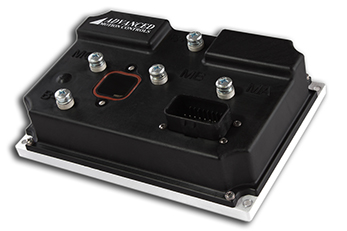 The M/V™ series Electric Vehicle Motor Controllers from Advanced Motion Controls' are fully functional, four-quadrant servo drives designed and built to operate today's modern mobile electric vehicular platforms. Providing high power from battery supplies with multiple operating modes, for either permanent magnet brushed or brushless motors, propels this motor controlling series ahead of all others. Whether for traction / propulsion, steering, lifting or any other electrically driven actuation, the M/V™ series is the newest member in a long line of successful motor controlling solutions from ADVANCED Motion Controls. Analog (AVB Series, AB Series) and Digital (DVC Series) models provide solutions for a wide range of command, configuration, and CANopen and USB network options. DVC models are configurable through DriveWare® 7, offering the same capabilities range of DigiFlex® Performance™ digital servo drives. AVB and AB models are configurable through DIP Switches and potentiometers.